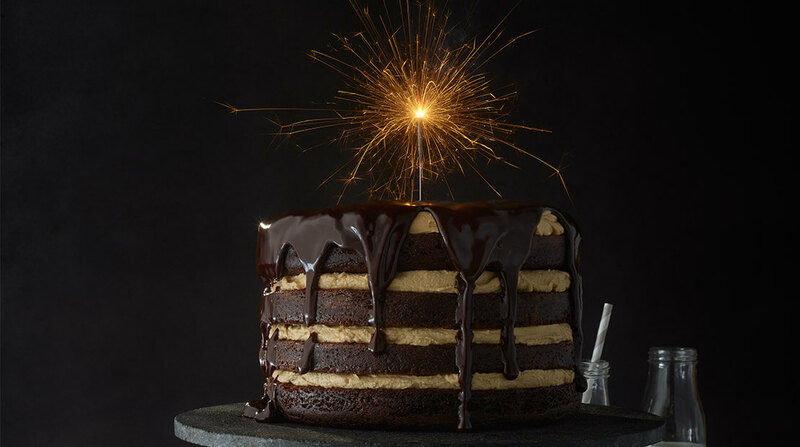 What better way to celebrate than with a mile-high, decadent peanut butter and chocolate cake? 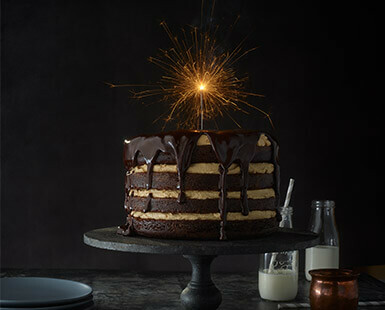 Most significant milestones in life are celebrated with cake – birthdays, weddings, graduations – and as Hormel Foods is celebrating its 125th anniversary, what better way to celebrate than with a mile-high, decadent peanut butter and chocolate cake? SKIPPY® peanut butter is the star of this show, although Hormel®Black Label® bacon and SPAM® classic were close contenders. This cake is as easy as it is impressive. 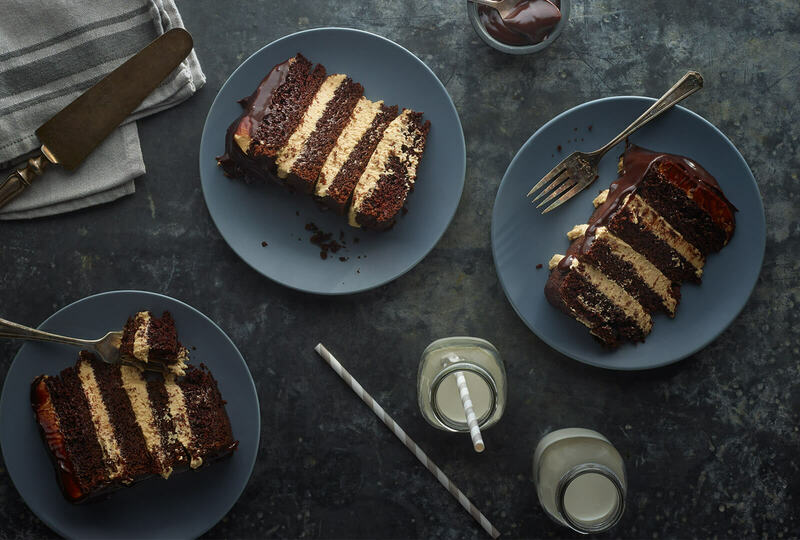 Two 8-inch cake layers, cut in half and sandwiched between layers of creamy peanut butter frosting are dressed up with a 3-ingredient ganache. 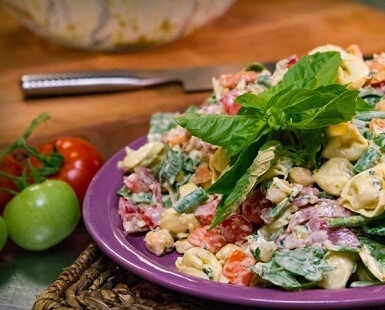 Whether you’re a savvy saveur or a not-so-sure-of-yourself novice, you can still enjoy this simple-to-make recipe. Grease and flour 2 (8-inch) round cake pans. 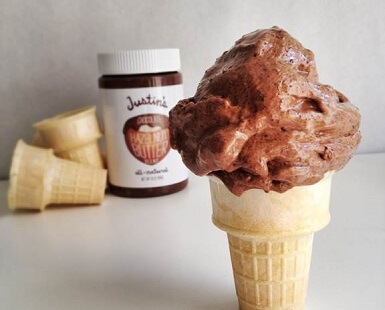 In a large bowl, stir together flour, brown sugar, granulated sugar, cocoa powder, baking soda, baking powder and salt until thoroughly combined. In a separate bowl, combine buttermilk, melted butter, eggs, vanilla and SKIPPY® peanut butter until combined. Gradually add buttermilk mixture to flour mixture with electric mixer. Once incorporated, add coffee. Beat until smooth. Transfer mixture to prepared pans. Bake 40 to 43 minutes or until a wooden pick inserted in the center comes out clean. Cool cake layers in pans on wire racks 10 minutes; remove from pans to wire racks and cool completely (about 1 hour). In large mixing bowl, combine SKIPPY® peanut butter, softened butter, vanilla and kosher salt until smooth. Gradually add powdered sugar, whipping cream and strong brewed coffee (cooled) alternately, beating with an electric mixer until smooth. In a small saucepan, heat whipping cream until small bubbles appear around edges. In a medium bowl, pour hot cream over chocolate morsels. Let stand 5 minutes. Whisk in softened butter until smooth. Let stand 10 minutes. Once the cakes are completely cooled, cut each in half for layers. Spread the SKIPPY® peanut butter frosting evenly amongst the layers as you assemble the cake. Frost the top layer and drizzle the chocolate ganache over the entire cake. Enjoy! The Hormel Foods 125th Anniversary Cake What better way to celebrate than with a mile-high, decadent peanut butter and chocolate cake?